St Anne, Commercial Road, London E14 7HP. Practices: We hold a joint practice with the Isle of Dogs band on Wednesdays 6.30 till 8.00pm and afterwards at Greenwich 8.00 till 9,30pm. We also arrange bell-handling lessons at St Anne’s on other evenings/weekends, by arrangement. Nearest tube: Westferry (Docklands Light Railway). If the church is locked, please press the illuminated button on the North West door. St Anne’s Limehouse and Christchurch Isle of Dogs share a small but growing team of ringers,. We also work closely with the Greenwich ringers to ring on Sunday mornings and evenings, and to practice and teach new ringers. 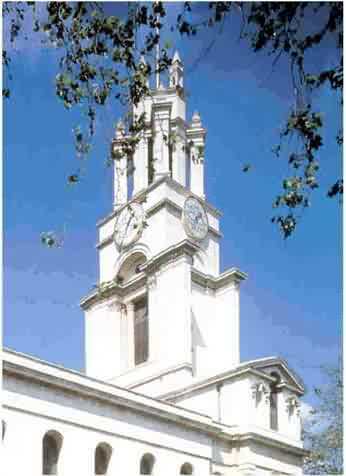 Eight of our ring of ten bells were installed in 1997 and were transferred from St Peter’s Walworth SE17. The remaining two bells were cast at the Whitechapel bellfoundry and added in 2004. There are one of the easiest rings of ten in London. Christchurch bells were fully restored in 1991 and are also very easy to ring. The tower is equipped with three computer simulators so that our newer ringers can practice ringing in time with the computer and learn quickly. As an ART Teaching Centre we are well placed to teach people to ring. We are always willing to teach new ringers, although we do ask that you join our combined band, or one of the other bands in the area, to ring regularly with us on Sundays. For more information contact Louise Booth.